The recently retired oil tanker Knock Nevis, formerly known as the Jahre Viking, was the world's largest vessel. Weighing in at almost 565,000 tonnes and measuring 458 metres (1,504ft) in length the giant ship had a beam of almost 69m (226ft) and drawing over 24m (80ft) of water it could not enter most of the world's ports. Given the complexity in manoeuvring such an enormous vessel, the ship was so massive it was too big to navigate through the English Channel. With a registered capacity of 13,500 to 14,500 Twenty-foot Equivalent Units (TEU) the world's largest container ship was launched on the 12th August, 2006 and named, 'Emma Maersk'. Built in the Lindo Yard in Denmark, the 397 metre (1,290 foot) long, first-in-class, vessel weighs 156,907 dwt and currently boasts the most powerful diesel engine in the world, a Wartsila 14RT-Flex96c, generating a whopping 109,000 hp. This power plant is capable of pushing the vessel to a speed of 25.5 knots. Although featuring accommodation for 30, despite its size, the ship only requires a crew of 13 due to the state-of-the-art technology that supports them. The 'Emma Maersk' was named after the owners' wife who passed away in December, 2005. Caligula's "Giant Ship", also known as the 'round ship', was a very large barge whose ruins were found during the construction of Rome's Leonardo da Vinci International Airport in Fiumicino, Italy. This was previously a Roman port a few miles north of Ostia at the mouth of the Tiber River. This Roman barge had a length of about 104 meters (341 feet) and a beam of about 20.3 meters (66 feet). It was 6 decks high, displaced a minimum of 7400 tons, and carried a crew of 700-800. Some speculate that this ship, or a similar ship, was used to transport the obelisk in St. Peter's Square from Egypt on the orders of Roman emperor Caligula. Pliny the Elder describes the sinking of a ship that had transported the St. Peter's Square obelisk from Egypt to use as the foundation of a large lighthouse in Ostia. This lighthouse was an imitation of the famous lighthouse in Alexandria, the Pharos of Alexandria. Its original name was MAGDALENE VINNEN; it was meant to transport saltpetre from Chile via Cape Horn. It was a very unusual boat for its times. In contrast to other sailboats it was equipped with an engine intended to help her maneuver in harbours. It also had an extra task: it was supposed to be a training boat for officers-to-be of the merchant marine. It could take 60 cadets per cruise. The Freedom of the Seas looks more like a skyscraper than a floating getaway. Its 15 passenger decks tower above the water, offering enough activities to keep voyagers occupied the length of any sea-bound vacation. Aside from 10 restaurants and 16 bars, the ship offers a wealth of sports activities, from swimming to surfing to ice skating. Post-exercise massages are available at the day spa and solarium. And the entertainment lasts late into the night in the movie theater, casino, and multiple dance clubs.The world's largest passenger vessel, she can accommodate over 4,300 passengers on her fifteen passenger decks, served by over 1300 crew. The Freedom of the Seas is 338.77 meters long. For comparison, the Empire State Building, without its spire, is 381 meters. The fastest propeller driven boat was the hydroplane Miss Budweiser which reached a speed of 354 km/h (220 mph) in Thermalito Afterbay in California in 2004. The deepest dives ever recorded fall to the Japanese research submarine known as Kaiko. 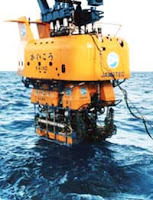 The unmanned vehicle entered the record books in 1995 when it dived to almost 11,000 metres (36,000 feet) to the bottom of Challenger Deep in the western Pacific. Kaiko proved that life could thrive at extreme depths and discovered many new forms of marine species.